The WLToys L969 truggy is my favorite R/C so far. However, nobody else seems to agree, since nobody talks about it much. The L969 is almost identical to the L959 car, which is wildly popular. But there are enough differences so that finding compatible parts can be a pill. So, here is a page for other L969 owners out there. L959 owners: This page is not for you. Go here now. This post covers items specific to the L969, which is the brushed-motor version. 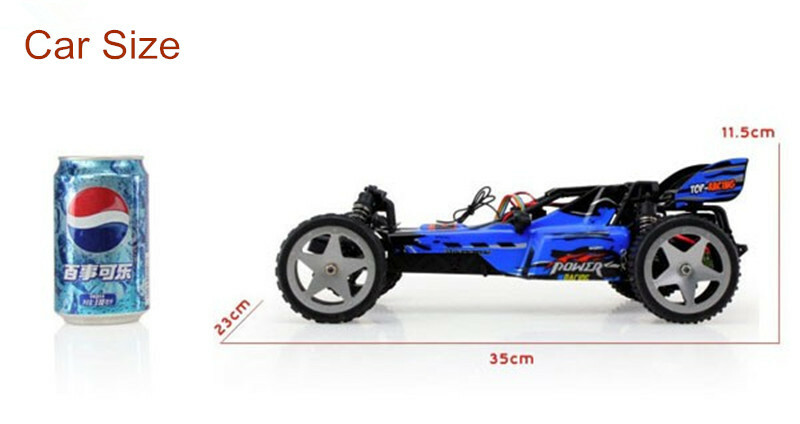 Given how WLToys made the L959/L202 cars, it makes sense that a L212 truggy will be a L969 truggy with the brushless parts from an L202. I have no way to verify this and so cannot list such information here. Generally, the L969 and L959 have identical specs and performance (including top speed). Traction is limited on all models, especially the brushless models. - L969 might be a bit more expensive than the L959. - Fewer vendors pay attention to the L969; parts are harder to get, and not always compatible with the L959. - The larger wheels/tires may put additional strain on the motor, and may cause the motors to break somewhat faster than on the L959 car. - Some trucks seem to be assembled with 12-tooth (12T) motors, which are hard to find. Using 14-tooth (14T) motors might work, but possibly not well. Note: The parts lists have been annotated with orange slashes to indicate parts specific to the L969. 540 motor has a diameter of ~36mm. Conventional wisdom dictates that the L959 (car/buggy), L969 (truck/truggy) and L979 (rally car/rally truck/truggy) are the same except for wheels, bodies (covers) and axles, but this is not correct. There are a number of parts specific to the L969. It is true that the L959 and L969 are about 80% the same. Anything not specifically called out here can be presumed to be identical to the L959, but you should check your parts guide to be sure. Note that some of these parts may also be compatible with the L979, L202, L212 and L222. I don't any of these and so cannot check this. Few places carry items specific to the L969. Worse, most vendors do not distinguish between parts for the L959 and L969. This is fine when a L959 part fits the L969, but is not fine when the L959 part does NOT fit the L969! Vendors even go so far as to confuse the L969 with the A969, which is a completely different model. Or, at least, throw in whatever keywords they think will attract clicks, regardless of accuracy. So, buyer beware! Note: ALL of the vendors listed above (except Litehawk) typically do not properly distinguish between L959 parts and L969 parts. So be careful what you order! According to the parts diagram, the following parts are unique to the L969. Descriptions have been transliterated from the manual. The "official" parts list does not use the "L" prefix (i.e. "L969-01") so neither does this list. However, be aware that with the rise of other similar models, such as the A969, many vendors may use the "L" prefix for their parts listings. More details on some of these are presented in the sections below; however, the specific differences are not known for all parts. All of the other parts have L959 prefixes and are common to the L959 car model. Tires are different between car and truggy. Duh! Note: Banggood has been known to sell rear tires as front tires. Rear tires have a hex hub, front tires have a round hub with no hex. Photos might be accurate but you may still get the wrong item. The L969 seems to use the same basic motor as the L959 but with a 12-tooth (12T) pinion (gear) attached. The prevalence of the different gear types is unknown. It is not known if all L969s use the 12-tooth gear or not, if this is a batch-by-batch thing, or if it was changed at any point in the past. However, the L969 does have different pinion and motor part numbers. So there is speculation that this is a model-specific difference between the L969 and L959, with all L959 cars using the 14-tooth gear and all L969 trucks using the 12-tooth gear. This has not been confirmed. The motor is the biggest PITA for L969 owners since nearly everyone sells the 14-tooth version, which might not be compatible with your truck. See "Motor Pinion" below. The motor pinion is a different part number than the L959. It is suspected that this is because the L969 truggy uses a 12-tooth (12T) gear, while the L959 car uses a 14-tooth (14T) gear. Unfortunately, both the 12 and 14 tooth gears appear very similar on casual inspection, so always compare the new motor to your old one. You can assemble the gearbox using the "wrong" pinion but it will feel stiff and require quite a bit of torque to get it to spin. Using the incorrect pinion version may cause motors to wear out prematurely, causing the car to go through motors or gears quickly. It may also cause the car to "stall" and stop working completely (both drive and steering) due to excessive current - this may be a feature of the receiver box. Using a replacement speed reduction gear along with the new motor may correct the issue, or it may not. It has not been verified if there are different speed reduction gears for the 12T pinion or 14T pinion. In fact, the rationale between having a 12T version and 14T version is completely unknown. You can move the original 12-tooth pinion to a new motor, but only if you have a good-quality 1.5mm hex wrench handy to remove the set screw from the pinion. You can also buy new 12T/14T pinions separately, but be careful you're getting the right ones. Note: RC Planet has the 12T version listed here, but the photo is clearly of the 14T version. Similarly, Hobbyworx has the 12T here, also with photos of the 14T. Longer, to accommodate the fatter truggy tires. The L969 is listed with a different motor mount. So it is possible the L969 and L959 motor mounts are actually the same part. This has not been confirmed. It seems that most, if not all, L969 trucks come with heat sinks. This may be because the bigger tires are expected to strain the motor more. Note that many receiver boxes do not actually have any spare connectors. If you get a heat sink with a fan, expect to have to splice in the fan yourself. If connected directly to the battery, the fan will run even when the receiver box is OFF; there are pros and cons to this. The L969 uses a T-plug (B1 on this diagram) on the battery. 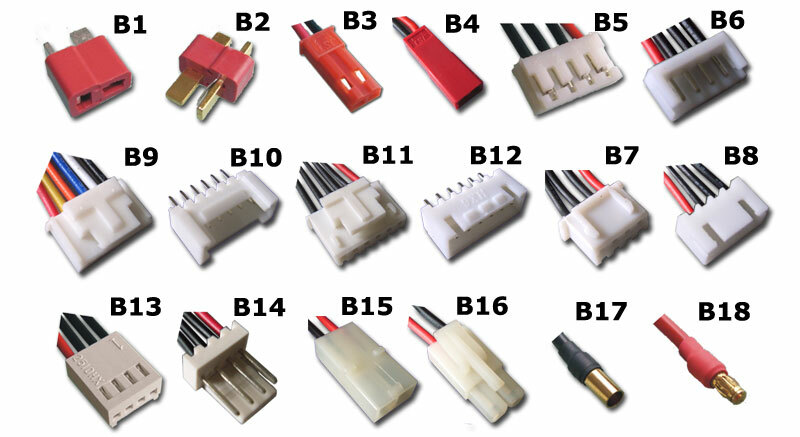 A T-plug is also called a Deans style connector. Not all batteries are created equal: they seem to range from 1500 mAh to 1800 mAh. Whether these specifications are real, or not, is up for debate. It is theoretically possible to swap in the 959-38 receiver with the JST connector (B3 on this diagram) in order to make it compatible with the L959. You would probably only do this if you had a lot of JST batteries and didn't want to modify or replace them for your L969. Some may be uncomfortable with the lower current rating of the JST, but in all honesty it will probably work just fine. The brushed motor, at least, doesn't pull enough current long enough for the connector to appreciably heat. Of bigger concern is the fact that since the receiver box is a different part number, it may have differences other than the external connector. There is no way to know for sure except to try it for yourself. Note: RC Planet has the L969-17 listed here, but the photo is clearly of the JST plug version for the L959. Same for Hobbyworx, shown here. The receiver uses a T-plug connector to match the battery. It is possible that low-battery or motor-overcurrent protection limits are different in the truggy reciever; this has not been confirmed. - Many vendors confuse the JST receiver with the T-plug receiver. Or, at least, use "reference" pictures that show the JST model, making it hard to know if you're going to get the T-plug model or not. - Some references indicate the receiver has spare plugs able to provide power for accessories, but actual receivers may not have these. If they are present, they might be blocked with waterproofing silicone or glue. So don't plan to plug anything in to the receiver aside from the stock servo and motor.